How could it be December 24th? This post was originally on the docket for the slower moving days immediately after Thanksgiving. Remember those? Here we are with all of that in the rear view mirror. Suffice it to say that I couldn’t let the day go by without sharing a story of an incredible gift, one that reminded me of the love and possibility that is resident in all of us. The gift didn’t come in a box nor was it from anyone I knew well. Its simplicity and depth reminded me of the powerful impact we can all make in each other’s lives. Just before Thanksgiving I ran a workshop at an agency that serves homeless and at-risk youth. This agency is one of my favorite places to do my work. My visits there remind me of the universal nature of transition. I am always humbled by the courage of the youth who join me. Many are there following a significant choice, a choice to leave somewhere and accept the uncertainty of the street and all that goes along with it. The workshop that day was focused on barriers. Like so many of us, the youth could quickly articulate the barriers they faced. Theirs ranged from tangible things such as a lack of a certification – like a GED – to more intangible things such as a belief in themselves or the courage to make a scary choice. We drew a fake wall with large paper and wrote the barriers on circular cut outs meant to resemble boulders. Once the wall was created, we worked to re-frame it. We played games to help us reconstruct our response to the barriers. In total, we learned that barriers in one form or another are always present. The key to navigating transition is changing our response to barriers so that we can continue to move forward in light of the barrier’s presence. After the session I was standing in the hallway outside the classroom. A young man who attended the session approached me. He thanked me for the morning and asked me for the title of my book. “I am going to ask for it for Christmas.” He said. He told me that the organization bought one holiday gift for each registered youth. I wanted to remind him that there were so many other gifts that could be useful to him. My book wouldn’t keep the heat on nor would it ensure that he landed a decent job. I learned from our quick conversation that his interest in my book was more like a thank you note than anything else. A gift he could give. Freely. Joyfully. Now, more than one month later, I remain moved by his willingness to extend himself to someone else at a time when the demands on him personally were so immense. I hope that my kind friend thought the better of submitting my book’s name to the holiday wish list at the organization. Even so, his gift to me withstands. May the season and the year to follow remind us all that we each have so much to give simply by being who we are. We make choices every minute of every day. Each moment represents an opportunity to bring forward the unique and incredible gifts that each of us alone possesses. Perhaps the greatest irony of this season is that the simple act of bringing ourselves forward is all anyone else needs. Thank you for walking with me through another year of transition. I am humbled by how much I’ve learned from the presence of each of you. Thank you for your gifts to me. Warmest wishes for a safe and happy holiday season and a great start to 2019! The long anticipated launch of my podcast, Destination Unknown, will debut the first week of January. Stay Tuned! Holiday posts from the past: Take a moment to read a few inspiring posts from Novofemina’s archives! Copyright © 2018 Linda Rossetti & NovoFemina.com. All rights reserved. No content on this site may be reused in any fashion without written permission from NovoFemina.com. 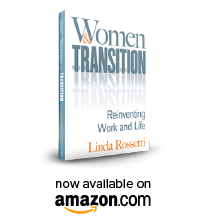 This entry was posted in Uncategorized and tagged barriers, choices, divorce, empty nests, graduation, holiday gifts, job loss, linda rossetti, novofemina, retirement, transition, Women and Transition: Reinventing Work and Life. Bookmark the permalink. Happy holidays linda!! I would love to catch up in the new year.